BRIGHTON, ONT – The Action Sprints invaded Brighton Speedway for round 8 of the 2018 tour on Saturday night. A large crowd filled the stands to welcome 18 action sprints for their first trip to Brighton along with a full racing card presented by Pinty’s Delicious Foods, Sticker Revival, Deerhaven Farm and Garden and Weaver Family Funeral Home. No. 9 Bryan Sudsbury looked like he was well on his way to claiming his first dirt career win at Brighton Speedway Saturday night. Sudbury led the field of Vanderlaan Pro Late Models to green and dominated 25 laps of the 30-lap feature while No. 55 Bradley Rayner took solid swings from behind. The pair battled side by side for first with No. 77 Caley Weese chasing close in third. With five laps to go, a caution slowed the action and Rayner leaped into the lead. The rookie Codrington driver held his line at the bottom while Weese rode the cushion treating race fans to a riveting duel. In a photo finish, Rayner scored his first career win a mere .064 seconds ahead of Weese. Sudsbury secured a hard fought third place finish, No. 1 Andy Mayhew took home fourth. No. 09 Robbie Wilson who battled hard to fend off a field of veterans in the back of the field earned fifth. No. 4B Mack DeMan and No.1 Holly Porter brought the sprints to the green flag for the 20-lap main event. Deman jumped out to an early lead, but before the first lap was completed a caution quickly slowed the pace. A complete restart followed with Deman and Porter going to war in a thrilling side by side battle for the lead while No. 4 Hannah Ferrell and No. 87x Shone Evans went head to head for fourth place. On the ninth time by, Deman stomped on the gas and took off as Evans drifted by No.5D Jacob Dykstra on the high side stealing third. Evans rapidly moved into second and zeroed in on Deman. Evans continued to work the cushion in an attempt to slide into the lead but the move was no match for the Mississauga driver as he drifted on the inside blocking the 87x at every turn. With two laps to go, a caution reset the field but it didn’t faze Deman as he sailed to victory lane leaving Evans and Dykstra to duke it out for second. Dykstra scored second, Evans third, Porter fourth and No. 68 Aaron Turkey placed fifth. No. 29 Rich Sanders and No. 3 Nathan Rinaldi took the Bainer’s Oil GARD Anti-Rust Canadian Modifieds to green in the 25-lap main event. Rinaldi pounced on the lead on lap two initiating an intense battle with Sanders. By lap six, Sanders punched on the gas snapping the lead back from Rinaldi. Sanders had his work cut out for him trying to hold off No. 32 Doug O’Blenis, No. 87 Andrew Hennessy and No. 39 Jonah Mutton as they closed in. O’Blenis drove hard from up to top, snapped the lead on the 16th lap and never looked back. The Napanee native cruised to victory lane securing his first season win with Hennessy in second. Mutton placed third, No. 12 Adam Whaley finished fourth and Sanders earned fifth. After a number of top five finishes, No. 2 Warren Mowat was looking to finally have a checkered flag for himself Saturday in the Brighton Automotive Thunder Stock 20-lap feature. 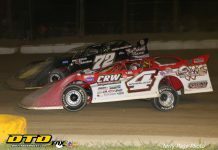 The Trenton driver vaulted over pole sitter Brain Mitts from his second starting position at the drop of the green flag. A couple of cautions brought the action to a halt at the beginning offering No. 72 Doug Anderson the chance to power his way up into the top five from his 11th starting position. For 16 thrilling laps Anderson hounded Mowat’s back bumper. Mowat wouldn’t be frightened and used the inside line to command the race as Anderson, Chris Dorland, Austin Reid and Wade Purchase battled it out behind him. 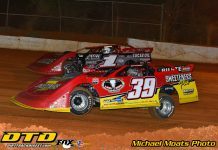 Mowat drove to victory lane for the first time this season. A win he dedicated to his late grandfather-in-law, chief pit crew member and local racing legend the late Willard Cormier. Anderson clinched second, No. 14 Dorland placed third, No. 85 Reid finished fourth and No. 53 Purchase fifth. No. 11 Adam Flieler wasted no time muscling his way to the top from his fifth starting position on the lead lap of the Bill John’s Comp 4 20-lap main event. As soon as the green flag dropped Flieler took off with No. 43 Devon Kippen and No. 14 Matthew Moore determined to catch up. With 13 laps remaining the three got bottled up behind lap cars which slowed the pace. Determined to get back to victory lane, Flieler pushed on to victory lane leaving Moore to settle for second. Kippen took home third, No. 0 Tyler French placed fourth and No. 50 Willy Bulten earned fifth. Behan Construction and McDougall Insurance & Financial presents the #77 Weese Racing Anti Bullying Night at the Races plus a complete race program featuring Vanderlaan Building Products Late Model Division, Bainer’s OilGARD Canadian Modified Division, Brighton Automotive Thunder Stock Division, Bill’s Johns Comp 4 Division, Quinte Septic Stinger Divisions. 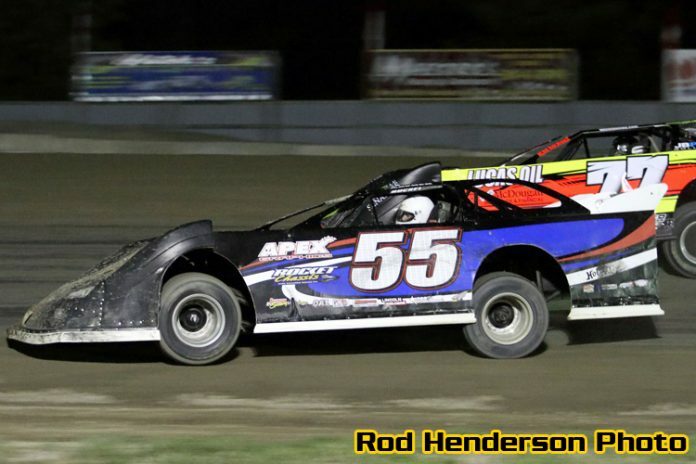 The Canadian Modified and Late Model Division will also have an opportunity to let their mechanics race at the end of the night. Races will Start at 7:00 PM, Front Gates open at 5:30 PM and Adult Admission is only $12.00. Participants with the Grey #77 Weese Racing Anti Bullying T Shirt are welcome to join us on the Front Straight for a group photo. Brighton Speedway Social Media: Follow Brighton Speedway on Twitter, @BrightonSpdwy, for live race day updates and track information. ‘Like’ us on Facebook at www.facebook.com/BrightonSpdwy. Brighton Speedway’s 2018 season is proudly supported by the following corporate sponsors: ABC Taxi, Adecco, Archer’s Poultry, B & H Carpet, Bainer’s OilGARD Anti-Rust, Bay Marine, Behan Construction, Bellevue Fabricating Ltd., Bill’s Johns, Brighton Automotive, Brighton Recycling, Campbellford Chrysler, Canadian National Autism Foundation, CANEX, Classic Rock 107.9, Coca-Cola, Comfort Zone Heating & Air Conditioning, Cool 100, Deerhaven Farm and Garden, Dibbits Excavating, Electro Cables, Excel Tower Service, Fidelity Engineering & Construction, First Place Trailers, Gerow Propane, Gord’s Water, Greig Truck & Trailer, Humber Nurseries, Hotch’s Auto Parts, Hoosier Racing Tire, ImageFactor.ca Motorsport Designs, John’s Equipment, Lange & Fetter Ford, Larry’s Towing, Lucas Oil, McDougall Insurance and Financial, Mix 97, Mystical Distributing, Owasco RV, Part Source, Pinty’s, Quinte Septic, Rapid Rad, Read’s Accounting, Rock 107, Sanderson Tire and Automotive, Stoneridge Specialty Insurance, The Community Press, TURRIS Communications, 95.5 Hits FM, UCB Radio Canada, Ultramar Parkland, Weaver Funeral Home, Workman’s OK Tire, Vanderlaan Building Products, VanZuylen Tire, and VP Racing Fuels. 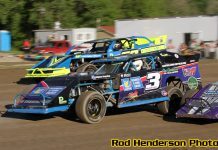 About Brighton Speedway: Brighton Speedway is a 1/3-mile clay stock car racing oval located on the shores of Lake Ontario in Brighton, Ont. The speedway hosts five weekly stock car divisions on Saturday nights and youth Go-Kart racing on Thursday nights from May to September. Brighton Speedway Mailing Address: 775 County Road 64, Brighton, ON, K0K 1H0.